Michael gets caught up in office gossip. Toby and Dwight go undercover following an incident in the warehouse. The recession hits Dunder Mifflin. Jim and Pam take The Office to The Falls for a wedding to remember. Part 1 of 2. Jim and Pam take The Office to The Falls for a wedding to remember. Part 2 of 2. A man in the Mafia? Pam and Jim return from their honeymoon and get surprise news from Michael. Special Halloween episode -- Michael makes a splash at a business meeting. Pam and Jim are forced to go on an uncomfortable double date - Linda Purl guest stars. Dunder Mifflin faces the shareholders. Michael is forced to tell the truth after he makes a promise he can't keep. Michael and Phyllis fight over Santa privileges. Michael tries to impress a potential buyer. Dunder Mifflin gets bought out -- Kathy Bates ("The Blind Side, "Revolutionary Road") Guest Stars. The office gets a visit from the Sabre CEO - Kathy Bates ("The Blindside", "Revolutionary Road") and Zach Woods ("The Honkys") Guest Star. 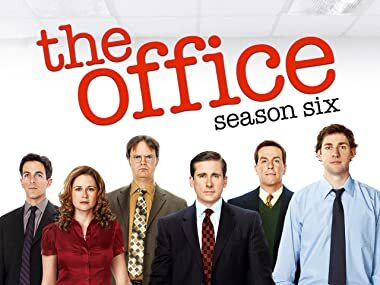 Part 1 of 2.Pam's (Jenna Fischer) contractions begin but she and Jim (John Krasinski) are determined to wait it out as long as possible so they can have more time at the hospital. Meanwhile the rest of the office tries to distract Pam from the pain with food and entertainment. Michael (Golden Globe winner Steve Carell) anxiously waits for Pam and Jim's baby to be born. Back at the office, Erin (Ellie Kemper) makes Andy (Ed Helms) jealous when she has lunch with Kevin (Brian Baumgartner). Michael struggles to please the new boss - Kathy Bates ("The Blindside, "Revolutionary Road") and Zach Woods ("The Honkys") Guest Star. The salesman is king - Zach Woods ("The Honkys") Guest Stars. The office enjoys a night on the town. Andy tries to give Erin a special "Secretary's Day". Michael has trouble reading body language -- Amy Pietz ("Aliens in America," "Caroline in the City") Guest Stars. Michael suspects his girlfriend is cheating -- Amy Pietz ("Aliens in America," "Caroline in the City") Guest Stars. Has Michael matured? Amy Pietz ("Caroline in the City") guest stars. Michael tries to figure out who is the leak -- Kathy Bates ("The Blindside," "Revolutionary Road") guest stars.